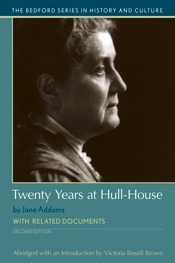 This new edition of Twenty Years at Hull-House highlights the importance of Jane Addams as an early leader of the Progressive movement. Addams’s narrative of life in an immigrant urban neighborhood provides students with an entry into the ideology of the Progressive era and the tenets of social activism. The revised, more concise, introduction provides a brief biographical sketch of Addams, outlines the convictions and decisions that led her to found Hull-House, highlights the political philosophy that guided her reform efforts, and traces Addams’s defense of her efforts to protect immigrants and those on the political margins from indiscriminate police prosecution. New related documents incorporate a diverse range of voices, including the memoir of an immigrant from Belarus who frequented Hull-House, an editorial by an Italian-American that felt out of place in America, and a letter from an African-American lawyer committed to fighting oppression. Readers of the revised edition will also find an updated bibliography and new questions for consideration.